Dusseldorf International Airport in Germany. 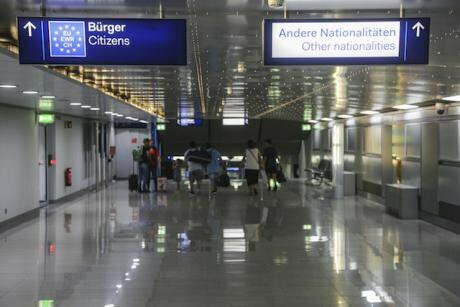 The signs are separating lines between All Passports, EU, Schengen passports or Other Nationalities.NurPhoto/Press Association. All rights reserved. A shadow of the unknown has been cast over Britain since the announcement of Brexit in 2016. On the lead up to Britain’s exit in March 2019, Theresa May has been tirelessly invoking what the future will hold in terms of immigration, the free movement and trade. Immigration has been at the forefront of the debate since the announcement of Brexit; and with no clear resolution, business owners, international students, non-UK residents have all been in the dark regarding the matter. Whatever the government decide, will shape the future of the country in terms of trade, industry, overseas relations and how other countries will, in turn, choose to treat UK nationals. After extensive delays and disagreements, the cabinet have unanimously decided that the UK should have a skill-based immigration system and that EU residents will not be accorded preferential treatment in terms of immigration. May has stated that this works in the best interests of the United Kingdom, as this will help to boost productivity and shape the future of the nation. In theory, a skill-based immigration system could work to reduce the skill shortages in industry sectors such as the NHS, engineering and IT. However, there are some implications that remain unresolved. As it stands, the UK immigration system is based on a threshold as opposed to merit or skill. Which means that many non-UK residents, including doctors and nurses have had their visa applications rejected previously. In addition to this, the UK and the EU currently uphold a “free movement” agreement, meaning that EU nationals can live and work in the UK, and vice versa. However, the cabinet have unanimously agreed to end this after Britain takes its leave from the European Union in March 2019. In order for the entire immigration focus to shift towards a skilled workers, it was necessary for the government to remove the priority status for EU nationals. However, this could have an adverse effect on trade, EU relations and overseas opportunities for UK citizens. Within the terms of the new immigration system proposal, it’s been outlined that in order to qualify for a Tier-2 skilled worker visa, the applicant will need to earn £30,000. Although this will ensure a certain level of capability for the skilled migrants that enter the UK to live and work, this could also be restrictive for those who possess the capabilities, but do not yet meet the salary requirements. Over the span of three months, NHS vacancies have risen by almost 10%, meaning that there are around 108,000 jobs that have been unfilled. In theory, the new policy could bridge the employee shortages in the future: however, this could also mean that some of the “lower-skilled” sectors could struggle to fill their roles. Although overseas doctors and nurses could be accounted for in the new post-Brexit immigration system, this could prevent vital administrative, management and clerical roles in the healthcare sector from being filled also. These limitations will benefit the healthcare sector by assisting with the key roles, but in the same heartbeat, could also be a hindrance in so far as scheduling, managing and all of the crucial behind the scenes work could be overlooked. In addition to this, industries such as the care and hospitality sectors that rely on so-called “low skilled workers” could suffer in the long term. This announcement risks antagonising EU leaders in the final months leading up to Brexit and will be likely to face criticism from those who argue that the UK should use the immigration system to negotiate preferential trade deals once it has left the EU. It has been announced that the UK will also introduce new “e-gate visa checks” for tourists and business travellers coming to the country for short-stay trips from “low risk countries”. This could work as leverage in the ongoing negotiations and can prevent any delays that UK nationals may face when entering the EU for a business trip or a holiday in the future. However, in terms of working overseas, UK citizens will most likely be placed under the same scrutiny as non-UK residents looking to move into the UK. Japan said that they would welcome the UK with open arms into TPP after Brexit. Which means that if any EU-UK trade relations become jaded after Britain takes its leave from the European Union, this could be a mitigating factor and much less detrimental than if Britain had no trade deals settled. However the Prime Minister of Japan has warned both the EU and UK parties that exiting with no deal could have extremely negative ramifications for global business. Which means that the government need to tread carefully in the final months leading up to Brexit. Despite the fact that UK immigration policy is a completely different matter to the post-Brexit deal, any immigration policy that can be deemed a hindrance to EU citizens could result in EU leaders revoking or changing the deal. In essence this could make a no-deal Brexit much more possible. Overall, the no-preference post-Brexit system would be a positive for failing sectors such as the IT and healthcare sector. This is a much better policy than the current immigration cap. However the lower level jobs are becoming much more difficult to fill. The government need to find a balance between appeasing the EU leaders, by agreeing to a level of leniency for EU nationals, whilst remaining true to the initial proposal. Additionally, many agree that the existing immigration proposal also needs to be reassessed because as it stands currently, the £30,000 minimum earning to qualify for a Tier-2 visa may be much too high and could prevent medium-skilled workers from moving to the UK and fulfilling the role. The Home Secretary Sajid Javid has agreed to assess the wage cap for skilled workers on the run-up to Brexit in relation to this. Although the premise is there with regards to the no-preference system, it is clear that the government need to do much more in order to create a more salient and appeasing immigration system before the UK leaves the EU in March 2019.